Seawatching is not my favorite way to bird. Standing on a boardwalk, a beach, or a jetty with my eye in a scope hoping against hope that a shearwater, a petrel, or a jaeger will fly through my field of view is too passive a form a birding for me to get really excited by it. But seawatching is an exciting form of birding in that the ocean, in my case the Atlantic Ocean, is vast, and almost anything could show up when you are staring out to sea. The first time I joined a dedicated crew of birders on a seawatch was in 2007 when I visited Cupsogue Beach County Park on the south shore of Long Island’s Suffolk County. Some of the heavyweights of New York’s birding scene were there and it was intimidating to some degree to ask where exactly the shearwaters and storm-petrels they were calling out were. Fortunately, New York, like most places, has some generous birders, and they were more than willing to help me get my life Greater Shearwater* and Wilson’s Storm-Petrels. And though I now have five more years of birding under my belt I still feel like a novice when it comes to seawatching. Even with the help of a book as good as Petrels, Albatrosses and Storm-Petrels of North America I still manage to get fooled regularly when seawatching, even by birds that I see often, like Common Terns. Birds fly differently over the open ocean and we land-based birders get to see seabirds so rarely it is difficult to really get an idea for a bird’s gestalt. So I’ve thought it through and decided on five easy steps to make me (and you too!) a better seawatcher. Practice – Yes, this is obvious. But the more time spent watching the water the more birds will be seen and learned. Research – Knowing what birds are expected when and exactly what their field marks are will make it that much easier to identify them at several hundred yards with a scope turned up to 40X. Seawatch with Good Seawatchers – This lesson I first learned on my first seawatching outing and it is really invaluable. Better seawatchers will pick up on more birds and identify them as well, while passing on helpful field marks for which to look. 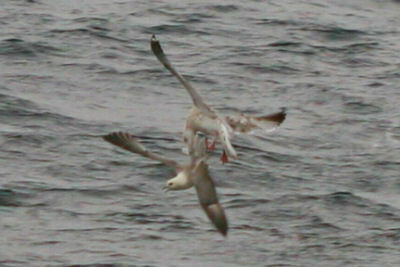 Go on More Pelagic Trips – The more time out looking at seabirds the more I will be able to identify them from land. This is a difficult step to take as going on a pelagic costs money and usually a full day so I might not be able to do more than the one or two trips a year that I usually go on now. Get a Better Understanding of Weather and Seabirding – I obviously understand that when winds are blowing from the south then the south facing shore of Long Island will be better. But what about east winds? Southwest winds? The more I understand the interaction of winds and birds the more likely that my time spend seawatching will be productive. Of course, I am sure that I have missed some other pointers for those who want to get better at seawatching. What do you recommend? I want to see more seabirds if only to keep my Queens list growing! *Yes, they are now called Great Shearwaters but at the time they were called Greater Shearwaters. If you practise seawatching, and your name is Corey F., and the year is 2012, do it with your eyes closed. No, okay, seriously: it seems that the most common mistake in seawatching is that people don’t look far enough. One tends to focus the attention on the areas of sea below the horizon, maybe half a mile or a mile out, when really you should be focussing on birds at or slightly above the horizon > 1 mile out. Tiny, tiny specs of dirt that are moving and are thus not dirt on the lens but pure birding gold. @Jochen: I hear that. Never thought I’d say this when I was a New Yorker, but here along the freshwater shore of Lake Michigan I’d be overjoyed just to see a Brant.